A fantastic opportunity for time with the family is coming up at the end of November. Disney on Ice is coming to the TaxSlayer Center from November 29th to December 2nd. The performance will be surrounding the classic Disney movie, Frozen. It will be just like the movie with the same songs, characters, and story. QC Family Focus has the opportunity to speak with one of the lead performers of the show. Morgan Bell, 27, is playing Princess Anna in the upcoming shows. She is overjoyed to bring the show to the Quad Cities. Bell has been skating for 23 years, a majority of them competitively. Her journey to Disney on Ice was not a straightforward path though. She suffered an injury to the MCL in her knee. After recovering, she learned about the opportunity to audition for Princess Anna for the Frozen shows with Disney on Ice. She tells us that being able to perform for Disney on Ice and bring smiles to the kids faces when she performs is something special to her. She and the other performers want to make an “iconic” and “memorable” moment for everyone who comes to watch. She says that she loves sharing her passion of ice skating with everyone and that all of the Disney skaters enjoy sharing the moment with the fans. Bell also gave us a sneak peek into what to expect when it comes to showtime. It is going to follow the script of Frozen to a T. She said that you should expect your favorite Frozen songs from “Let it Go” to “Love is an Open Door.” She said that all of the beloved Frozen characters will be there as well from Elsa to Anna to Olaf and Sven. She did say that there will be some surprise Disney princesses making appearances as well. One thing about the show that you do not get to see as well is the preparation that goes into the performance. She says that the whole cast and crew spends two months rehearsing and practicing to make sure that the choreography is perfect. It is all that hard work that makes the performance extra special for both the skaters, and the fans. When asking Bell who this performance will appeal to, she said that there is a little taste of everything for everyone. She said moms love the dresses and choreography. Dads are always impressed by the effects and the pyrotechnics. She also says the kids love seeing their favorite Disney characters right in front of their eyes. So in her eyes, this is a great event for everyone in the family to go see. She also says that it would be a fantastic date night for couples to go out to as well. 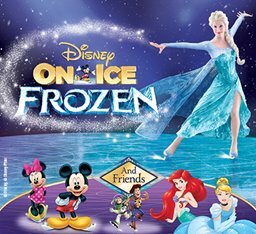 Tickets are available at Ticketmaster and Disney on Ice’s website starting at 15 dollars and the shows go from November 29th to December 2nd.